In the Winter the cold forces us to dress more practical for the most part. We want multiple layers of thick, cozy clothes to help beat the cold. Unless you plan on spending a ton of time outside though you can still wear what you want, you just have to make the right choices. One thing I noticing a lot of people wearing a lot less of is dresses. I love how easy a dress look comes together. You have the dress, the shoes, and a few accessories and you are good to go. In Winter though, you have to choose wisely when it comes to the accessories. Wear tights or knee high socks to cover your legs. Boots are perfect for a dress and for Winter. I say the taller the better. Add a stylish coat, gloves, and a statement necklace and your dress is good for Winter. 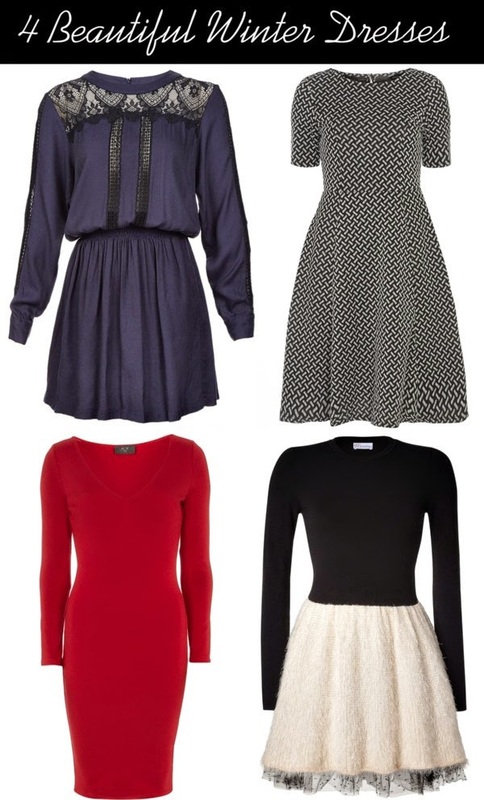 Above are four of my favorite long sleeve dresses right now. Well, one of them doesn't have long sleeves but I loved it anyway! What do you think? Wow! The last one is my absolute favorite! It looks simply amazing!! Totally awesome picks!! Love that first dress!! I wish it was easier to find cute long sleeved dresses for winter. I also really love the last one and how it looks like separates. The simplicity of the red dress really appeals to me and I often admire red dresses even though I don't yet have anything red in my wardrobe! That faux fir skirt dress is cool!